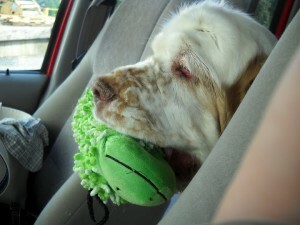 Well-mannered dogs and pets make us happy to offer our rentals again and again as pet-friendly. 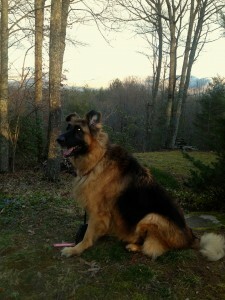 Take your pet with you on your restful, rustic North Carolina vacation at Cloud 9 Relaxation home in Asheville. Our woodland vacation rentals feature a diverse landscape and wide runs so you and your pet can enjoy hours of playtime in a rustic escape. And there is so much to do here…a lazy lounge on the deck or full throttle down a nature trail…all on Cloud 9 properties. You don’t have to drive anywhere to take your dog for a walk. It’s all right here. What a great place to have fun with your family and your pet. Paths to explore, off path exploring, too, the woods smells, creature smells, the creek, the pond to swim in, the cows to gawk at and harass, the chickens to drool over… ooh la la…to be a dog on Cloud 9! Never worry about your pet again during your vacation. 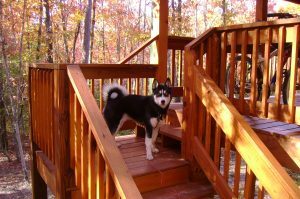 Our pet friendly cabins allow you to take your best friend along without the hassle of boarding or pet sitters. 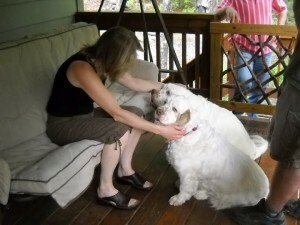 Cloud 9 Relaxation understands how important your pets are and why it is essential for us to be able to offer these pet and dog friendly vacations in Asheville, NC. 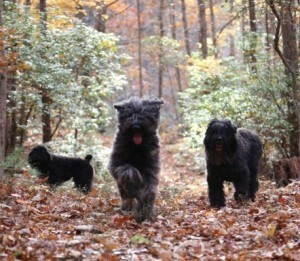 The fresh smell of forest leaves, extensive trails, scents of rabbits, squirrels, deer and wild turkeys revitalizes the spirits of humans and animals alike. Your pet will discover new excitement while sniffing on the wooded trails surrounding our quaint cabin homes. Pets also enjoy an afternoon swim or fetch the stick in Petersen Pond, viewing the cows in the pasture or the fenced in chickens. After an exciting day, you can rest assured that your pet will sleep well. Our visiting pet owners are always diligent about preserving our valuable landscape and cabins to make a beautiful vacation for all. Contact us today to reserve your pet-friendly cabin. 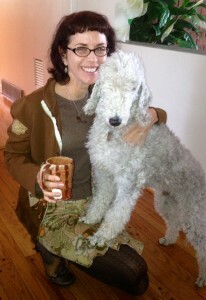 We love visits from well-behaved dogs. They deserve a vacation, too! Q: Is there a fenced in yard? A: Yes, for our Luxury Cabin, Silver Lining. 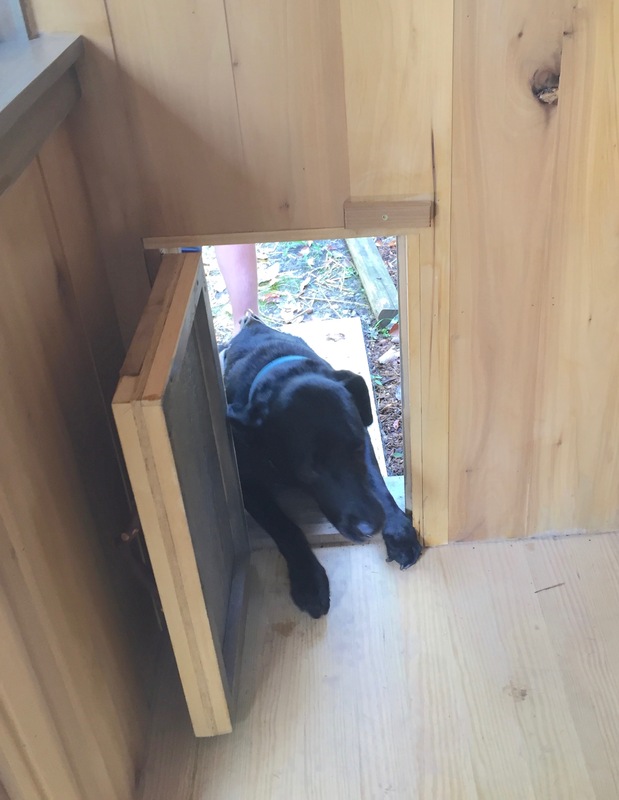 No, for the others and Sawyer’s Cabin is not pet friendly. 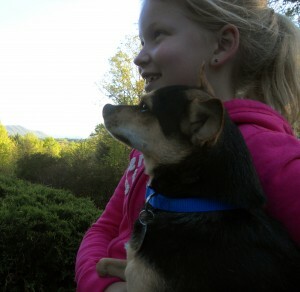 Pets are happy to be outside at Cloud 9 Relaxation Home. Q: Do you have a dog kennel? A: YES, we have a 10 x 10 ft fenced kennel with a dog house, if needed, in the yard close by Cloud 9 Relaxation Home (out of the mountain view siting). It is is in the shade most of the day but we have a tarp for the top when too sunny or rain. 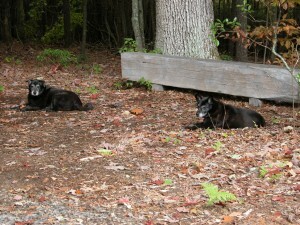 At Heavenly Hideaway cabin we have a 6 x 10 ft fenced kennel with dog house. Q: Do you have a gated deck? A doggy door? A: The deck of Cloud 9 Relaxation Home is magnificently huge. With horizontal cable rigging between stainless steel rails and two gates, your dog will be kept on the deck.f The Heavenly Hideaway cabin deck has a built in gate and wrap around deck. 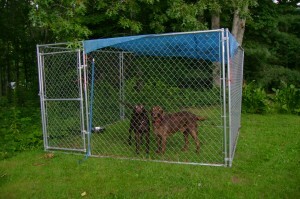 Keep the back door open and your dog can go in and out without you. Q: Are there other dogs that you own on the property? A: No. Your dog will be the ALMIGHTY of the Hill unless another renter has a pet, then we will tell you where the dog party is. 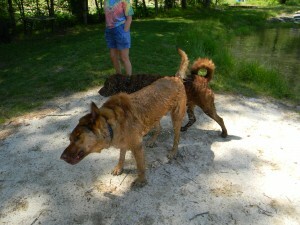 Friendly dogs, friendly renters meet on a hike to Peterson Pond. Q: Have you ever had a misbehaved dog? A: Yes, one pet owner of a little dog thought it was OK to close him up in the bathroom. Well you can guess what he chewed on and scratched. A damage fee was accessed for refinishing the door. Another time, a dog got a hold of the dolly in the little person toy drawer and ripped its head off. Replacement was found on Ebay for a damage fee. Bring your own pet toys and for that reason, we don’t allow puppies. Q: Do you allow cats? They are pets, too. A: If you have ever seen someone start to swell up, get watery eyes and sniffles with just the dander of an absent cat, you would know why we can’t allow cats. Q: Do you have ticks? Q: Are there pet friendly restaurants in Asheville? 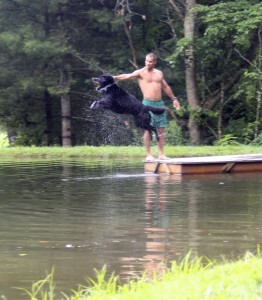 Enjoying the day with a swim after a stick in Peterson Pond on Cloud 9 Farm. Q: Where can I take my dog for recreation? A: You know the BEST place for you and your dog? Right here on Cloud 9 Farm. Play, swim in Peterson Pond, fetch in the open fields…just be happy that you brought your beloved pet to enjoy the mountains together. 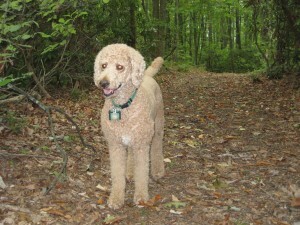 You will love all the hiking trails through the woods that you can take your canine on. On leash or off leash…it’s at your own risk. Q: Are there any additional fees for pets? If your dog sheds a lot, please bring a pet brush and cast that “second dog” ball of fur to the wind. Brush your dog before you come, too. Pooper Scoopers NOT needed. You’re on a farm, remember. A shovel is provided if your dog goes in the yard, scoop it with a throw to the woods but heck, if you’re in the woods, that’s even better. If you bring those baggies, please don’t use them. We believe in natural composting without the help of the 1000 year life of plastic. We do ask that your dog’s nails be clipped so they don’t dig into the wood floors with the polyurethane finish or scar doors with jumping up. Our expectations are that all responsible pet owners have solved the flea problem, right? Where does your dog like to sleep? We hope it’s a crate, bean-bag chair or blanket that you bring. No dog that shows they miss you by chewing on furniture or doors may stay unattended in the house. You must bring your own toys, a crate, use the outside kennel or hire a dog sitting service if they are chewers or they are not used to you leaving them for a few hours. Bring covers for all furniture that you think your dog may jump up on. Bring a towel for your dog’s feet that must be wiped after being outside in wet grass or gravel. If your dog has many whiskers you may need to wipe after drinking or eating to prevent stains on furniture. As clean as your dog may be, the maid is always hired for an extra “Spring Cleaning” after a canine visitor. That’s where the pet fee goes. Thank-you! 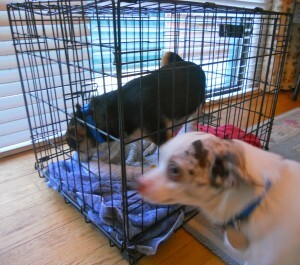 Dogs feel safe when you bring your dog crate on vacation. 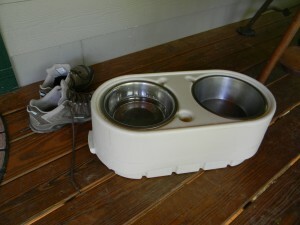 Be sure to bring your pet’s familiar food and water dishes to Cloud 9. Located in downtown Black Mountain on Cherry Street stop and get a free dog treat sample (and water). They have crazy, unique artwork for pet lovers, too.In fact the whole town of Black Mountain is pet friendly and the quaint gift shops don’t mind if you bring Fido inside. Sitting at the outdoor cafes with your pooch is seen all the time. Three Dog Bakery 21 Battery Park, (828) 252-1818Yep, Asheville’s gone to the dogs. Three Dog Bakery is the nation’s leading producers of the best all-natural foods and treats for dogs. If you don’t walk away with a personalized “Dino” bone, Strawberry Cremes, or Golden Peanut Butter filled cookies (and yes, you CAN eat them yourself) you can get their Three Dog Bakery Cookbook to take home and make them yourself. Sitting at the outdoor cafes in Asheville is allowed and encouraged. Need to stay out longer? Contract with us for just a few dollars and we’ll walk your pets around the house or feed them– so you can squeeze in a little more Asheville fun time and not feel guilty. Q: Do you have bears? A: We have to say yes to black bears – but NOT brown (grizzly) bears. Once in a while a bear passes through, and that’s why Cloud 9 Farm honeybees in the valley have an electric fence around them. Q: But have bears ever caused a problem for people? A: No, no encounters, except from a distance where the bear and human looked at each other from about 400 feet away, then both went their separate ways. You surprised the bear and you are considered a threat – when hiking alone, you tend to be more quiet and can accidentally sneak up on a bear. By hiking in groups and carrying on conversations, you will alert animals to your presence. You don’t need to yell, whistle, or ring bells, but don’t be silent. You are considered a threat to young cubs or food – accidentally getting between a bear and her young is a bad situation. Whenever you see a bear, assume that there are young around or the bear is feeding. Don’t go any closer and keep your eyes open for cubs. Bears usually avoid humans. 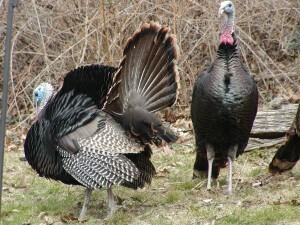 But if you do encounter one, it’s important to remember that they are powerful and potentially dangerous animals. Like we said, Black bears have never been a problem at Cloud 9 Farm which is surrounded by residential neighborhoods, lowering the risk, unless 200 acres away someone is tempting them with bird feeders or garbage. The NC Arboretum is 25 minutes away, off the Blue Ridge Parkway Parking and is $8 per personal vehicle (free the first Tuesday of each month.) They have more than 10 miles of hiking and biking trails adjacent to the Bent Creek Experimental Forest. Dogs on leashes are permitted on the grounds, but not in some garden areas. Biltmore Estate Allows Pets. George Vanderbilt had a dog named Cedric, a St. Bernard. Take your pooch to see him (his statue) outside of Cedric’s Tavern and toast pet friendly hikes on the estate with a Cedric’s Pale Ale while you sit around the green listening to music at Antler Village. You can’t go in the Biltmore House, of course, but “yes” to the beautiful grounds with a leash and baggies. The Blue Ridge Parkway Fresh air for you and your pet…why not show your dog the highest mountain on the east coast by following the Blue Ridge Parkway north for 45 minutes from Cloud 9? 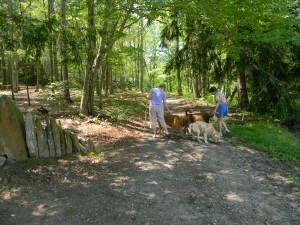 Dogs are allowed on leash on over 100 different trails. 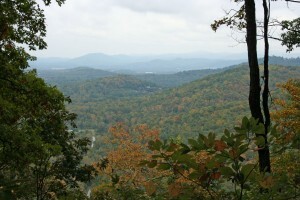 Pisgah National Forest and Nantahala National Forest allow dogs on the hiking trails. 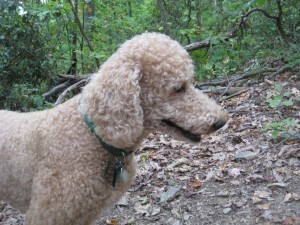 In the Great Smoky Mountains National Park dogs are allowed in campgrounds, picnic areas, and along roads, but are only allowed on two short walking paths—the Gatlinburg Trail and the Oconaluftee River Trail. Why? The Great Smokey Mountains National Park has prohibited dogs in the back country since the park was first established in the 1930s. Dogs can chase and threaten wildlife, scaring birds and other animals away from nesting, feeding, and resting sites. The scent left behind by a dog can signal the presence of a predator, disrupting or altering the behavior of park wildlife. Small animals may hide in their burrow the entire day after smelling a dog and may not venture out to feed. Pets may become prey for larger predators such as coyotes and bears. In addition, if your dog disturbs and enrages a bear, it may lead the angry bear directly to you. Yes, my dog actually snorted with the new smells on Cloud 9 Farm. “Sugar and Spice” soak up the sun on an October day at the edge of the woods. I’m ready for that walk you promised me on Cloud 9! 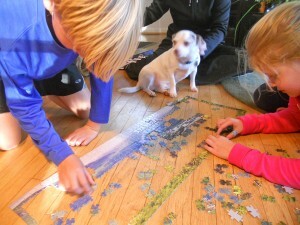 “Bandit” is trying to figure how he can help with the puzzle at Cloud 9. 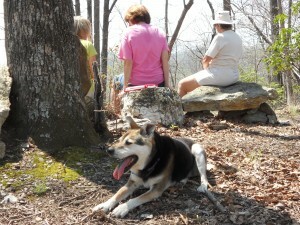 Your pooch may not enjoy the view from our mountain top hike as much as you but they will know a stop to rest is welcome. “Destiny” makes the hike to the top of Buzzard’s Roost. 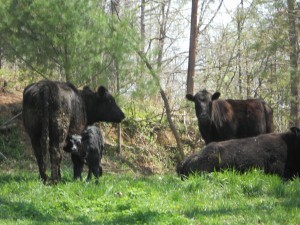 The wildlife abounds for your pet to smell at Cloud 9 Farm. 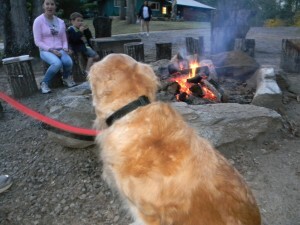 Pets enjoy the excitement of the fire pit, too! 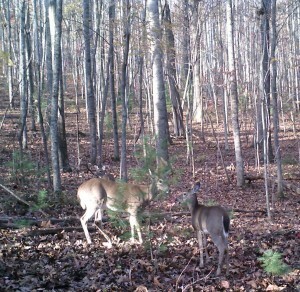 Silent deer browse in Cloud 9 Farm Woods making delicious smells for your pet. Florida Dog “Kenya” relishes a walk in the woods. Cows are curious about dogs. 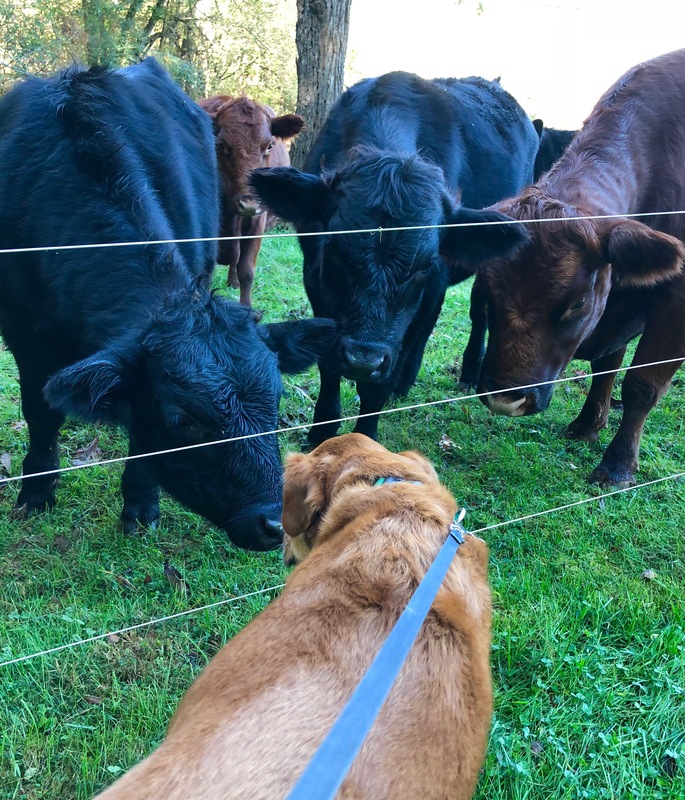 Dogs are curious about cows on Cloud 9 Farm. 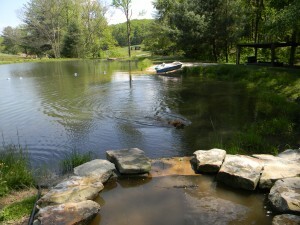 Pond fun for you and your canine. Jake, the dog, feeling GOOD at Peterson Pond. 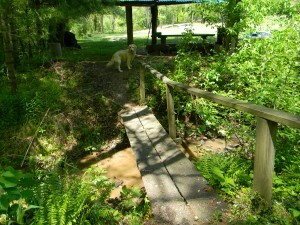 “I crossed the bridge all by myself!” barks Happy. Rocky is in his element now.